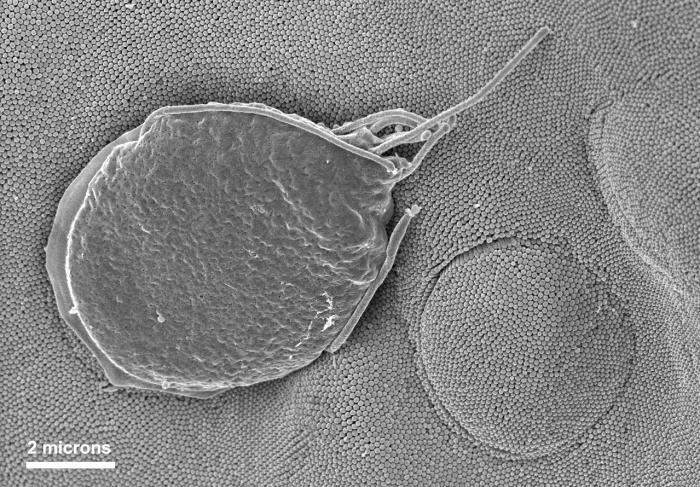 This scanning electron micrograph (SEM) depicted a Giardia muris protozoan adhering itself to the microvillous border of an intestinal epithelial cell. Each small circular profile under the protozoan represents the rounded tip of a single microvillous, and it is estimated that 2000 to 3000 microvilli cover the surface of a single intestinal epithelial cell. The two circular lesions on the right side of the photograph are impressions made by the ventral adhesive disk of other G. muris organisms. This disk acts like a suction cup, facilitating the organism's attachment to the intestinal surface.